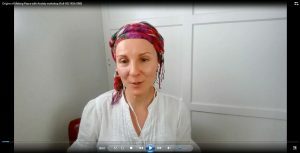 My dear people, in this video I share a vulnerable topic about quite a tough chapter of my life that shaped me as a woman, gave direction to my professional yogic career and gave birth to my workshop "Making Peace with Anxiety". To me, speaking up means: to accept and reconcile with your traumas, and to make stagnant energy of your pain body to flow. I have been "there", I hit the rock bottom. It took me years to integrate what I went through, and transform it into a learning experience. All the tools that I used for that have been around for centuries. What I did was to bring them together and practice, practice, practice. And that's what I pass along to you in my workshops. "If your emotions and state of mind affect your breathing, your breathing can affect your emotions and state of mind." MAKING PEACE WITH ANXIETY™ is a successful fusion of yogic breathing and movements, meditation, neuroscience and deep personal insight brought together by a yogini who lived with severe anxiety for a couple of decades of life. Join me at Life Path Retreat Center , located in one of the most beautiful cities of Mexico and the world - San Miguel de Allende, Mexico. SUNDAY OCTOBER 28TH 2018, 1:00 -5:00P.M. LIFE PATH CENTER - Andador Rinconada de la Aldea 29, Centro, San Antonio, 37750 San Miguel de Allende, Gto., Mexico. PREREGISTRATION IS REQUIRED TO ENSURE YOUR SPOT, AS SPACE IS LIMITED. To preregister for this event choose one of the payment options below: Save your spot with a non-refundable deposit of $30.00 (the balance is due the day of the event), or Prepay $95.00 for the event (in case of cancellation, a $30.00 fee will be applied). adjust the temperature and energy flow in the body. The story shared and exercises presented in this workshops will help you gain confidence in faith in your inner power and transformation. kryas suggested by UCSD BioCircuits Institute as an effective non-invasive approach to the treatment of anxiety, panic and stress disorders. therapists, healers and yoga teachers. All levels welcome. NO previous experience necessary. 18 to 70 years old welcome. Cushion or blanket for comfortable sitting recommended. Have a meal NO less than 1 hour before the event. Extend your stay in San Miguel for three more days and witness one of the most colorful traditional holidays in Mexico - Day of the Dead (Dia de Muertos) from Oct 31 to Nov 2. There are multiple charming B&Bs around San Miguel, hurry up to ensure your accommodation.